The genes most commonly associated with celiac disease are the HLA-DQA1 and HLA-DQB1 genes. There is one allele of HLA-DQA1 (DQA1*05) and two alleles of HLA-DQB1 (HLA-DQB1*02 and HLA-DQB1*0302) that each increase the risk of developing celiac disease. What are HLA-DQA1 and HLA-DQB1? What are my risks of developing celiac disease if I test positive? If I test negative, am I still at risk of developing celiac disease? 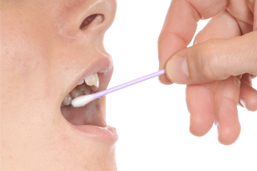 Receive more information or to get your clinic set to up offer Celiac Disease DNA testing to your patients. How will I receive my results? How long will testing take? What are the possible results and what are the interpretations for each result type? © 2019 Genetrace Laboratories. All Rights Reserved. We have sent an Email to ' + $('#email').val() + '. Click the link in the Email to reset your password. If you don\'t see the Email, check other places where it might be, like your junk, spam, social, or other folders.